The most anticipated Dia de los Muertos (Day of the Dead) theme event of the year is upon us and you cannot miss the festivities of our Cultura and heritage which celebrates the lives of those that have passed on in the most elegant yet traditional style. El Velorio has been celebrating with the community of Los Angeles for five years now and the line up of artists, performers and celebrity hosts are become more exclusive each year and I am really looking forward to this year’s MC, Chicano Cartoonist Lalo Alcatraz along with Alysha Del Valle of ABC7 Eyewitness News. On November 7, 2015 this event will open its doors at Plaza De La Raza, free admission and for all ages from 4:00pm to 6:00pm with lots of activities for the children to do as well as food vendors and face painting. I cannot wait to bring Frida and enjoy our tradition to celebrate the lives of our loved ones. After 6:00pm, the night will turn into a 21 and over party with two stages with my favorite band La Sonora Dinamita as well as a DJ dance floor on the grand garden. So I will be bringing my dancing shoes and dance some cumbias all night long. Aside to the dancing, the Dia de Los Muertos (Day of the Dead) art exhibit curated by Antonio Pelayo will also bring out our beautiful traditions to the public that appreciates our culture; our catrinas, panteones, altares and beautiful fashion will be the highlights of this event. I hope to see you all there, I love this time of the year! 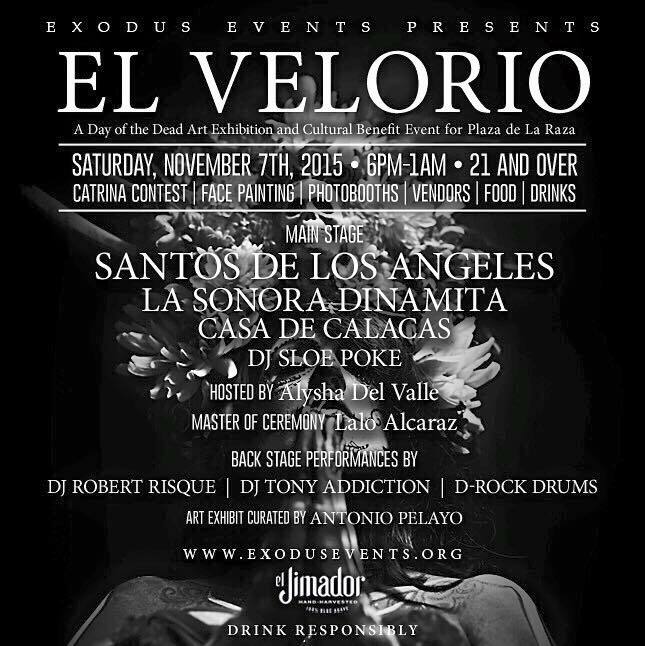 Los Angeles, CA (September 23, 2015) –El Velorio is on its way starting November 7th, 2015. 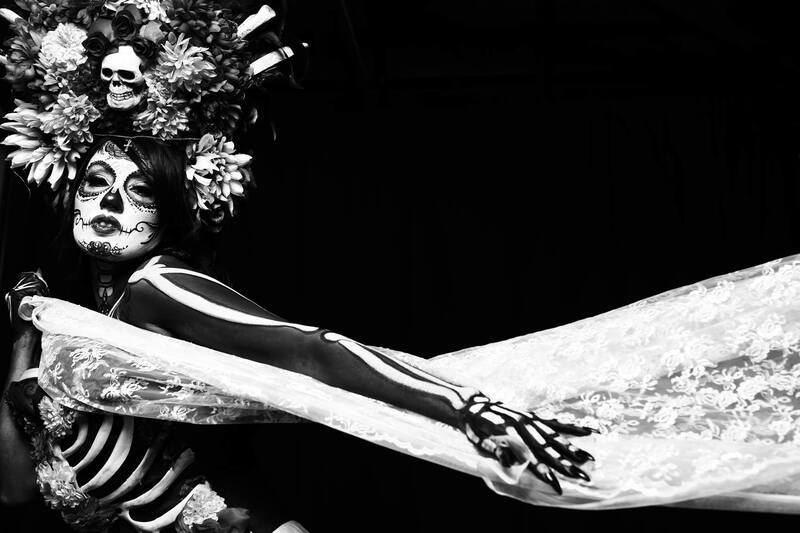 Get your tickets early, and put El Velorio on your calendar for one night carnival at the famous Plaza De La Raza filled with live music, a curated art exhibit, culinary food, beer and wine garden, artistic face painting, alters, sugar skulls and bliss! El Velorio has been celebrating and honoring Dia De Los Muertos for five years. Dia De Los Muertos (Day of the Dead) is a traditional holiday dedicated to celebrate the cycle of life. It’s a day to share food, music, and fun with the community. The celebration acknowledges that we still have a relationship with our ancestors and loved ones that have passed away. This year’s El Velorio will also have an ALL AGES section at Plaza de la Raza! From 4-10pm with food booths, skeletal face painting, and art and craft vendors. DIY art projects for kids and adults include ceramic or sugar skull painting, paper stamping and more. Help create an altar, or ofrenda, by bringing photos or stories of loved ones, candles, breads, or flowers to add to the altar. This extraordinary event will also continue this time honoring tradition into the night from 6pm-1am for the 21 and over. El Velorio will be one to be remembered for a new platform for presenting fantastic musicians throughout the night. The night will kick-off with two stages. On the main stage will be Mexican Norteño Grammy-winning La Sonora Dinamita, Santos De Los Angeles, Casa de Calacas and DJ Sloe Poke. While DJ Robert Risque, Tony DjAddiction and D_Rock Drums grace the Garden Stage for your dancing pleasure. MC of this year’s El Velorio 2015 in non-other than nationally-syndicated multi-award-winning Chicano cartoonist and a sought-after writer, currently working on Pixars new Day of the Dead Project, Lalo Alcaraz, alongside hosted by Alysha Del Valle of ABC7 Eyewitness News. El Velorio is brought to you by Exodus Events (www.exodusevents.org). Exodus Events is the fastest growing event agency, who has produced events as La Bulla, La Story, Tatuaje, and El Velorio with a huge lineup of artists appearing at every event that help raise awareness for the arts. El Velorio will benefit Plaza de la Raza. Plaza is also one of the city’s most popular points of interest for visitors, artists and performers, and it is highly regarded by the surrounding community as a “safe haven” for local youth. Saturday, November 7th, 2015, 4:00pm – 10:00pm All AGES (free admission) Saturday, November 7th, 2015, 6:00pm – 1:00am 21 and over. Pre-sale tickets for evening attraction are available $15. To pre-purchase tickets and avoid lines day of the event, please go to: http://www.elvelorio.eventbrite.com . Tickets will be available at the door for $30. Press Pass available to press. Like us on Facebook: https://www.facebook.com/exodusevents Follow us on Instagram:@exodus_events Twitter: @exodus_events and YouTube: @ExodusProd. 3rd. Annual Kush Life Halloween Party!